I'm always interested in hearing what a band is going to sound like after a long hiatus from the metal scene. Celtic Frost just happens to be latest band attempting to make a comeback and some kind of impact in the process. The one constant with Celtic Frost has been inconsistency. No two Celtic Frost albums are alike from start to finish. They have become somewhat unpredictable with each release. Personally, I felt they started at the top and slowly declined with each album. The order in which their albums were released is the same order that I like them in. I'm not sure if this pattern will be broken with their newest release, "Monotheist". "Monotheist" is the first Celtic Frost album in almost thirteen years. It features eleven songs all produced by the band with Peter Tägtgren (Hypocrisy, Pain). The band consists of original Celtic Frost members Tom Gabriel Fischer (voice and guitars) and Martin Eric Ain (bass). They are joined by new members Erol Unala (guitar) and Franco Sesa (drums). Upon the first spin of "Monotheist", I can say that I was not very impressed with what I heard. With each listen though, I began to differentiate between some pretty decent tracks and some utter filler. 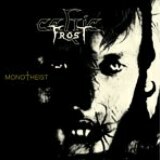 "Monotheist" seems to offer elements found on some of the past Celtic Frost albums while experimenting with some newer styles. It's an album that is sure to divide some die hard fans while gaining some new ones. "Monotheist" is a crossover of sorts that in some ways reminds me of what Kreator did on "Renewel" or what Coroner did on "Grin". "Monotheist" is a dark, unfeeling slab of depressing, borderline industrial metal. This seems to be reinforced with thick, metallic, detuned rhythm guitars and heavy bottom end drums. The music is straight forward and very slow to mid tempo. "A Dying God Coming Into Human Flesh" is a slow pounding, torturous song that is comparable in pace to something from the Hellhammer days. The vocals are distorted and remind me of the technique that is used on some of the latter Dimmu Borgir albums. A change in direction is taken with track four, "Drown In Ashes". This is where Celtic Frost's "avant garde" influences creep in, with clean male vocals mixed in with gothic female ones. It is a very laid back kind of track, something that the album probably could have done without. This sounds like a more sinister, warped version of later day David Bowie. "Os Abysmi Vel Daath" gets the album back on track somewhat. This sounds like something that could have been on "Into The Pandemonium". Again, it's somewhat "avant garde" in style. Warrior mixes in his painful clean vocals with some more aggressive ones. There are some female vocals used at times in the background. It is also another slow, driving song, using some weird feedback harmonic guitar effects. The drums pick up a bit towards the end. "Obscured" has a very hypnotic feel to it with the tribal like drum pattern and it's slow repetition followed by more psychedelic guitar wailing and Warrior's clean vocals. "My Domain of Decay" and "Ain Elohim" return to the style of the the first two tracks. "My Domain of Decay" includes a an incoherent guitar solo . "Ain Elohim" is probably one of the thrashiest tracks and is reminiscent of classics like "Circle of the Tyrants" and "The Ursurper". "Incantation Against" is another avant gard filler track. It has a Middle Eastern influence with a gothic a female vocalist singing hypnotically. Again, a track that interferes with the consistency of the album. "Synagoga Satanae" could be considered the first Celtic Frost epic. It is fourteen minutes of slow, pounding doomy metal again in the vein of Cathedral and classic Hellhammer. "Winter Requiem" closes out the album. It's an orchestral string track instrumental that sounds like something off of a Dimmu Borgir album. Over all, "Monotheist" is a concerted effort in trying to recapture older Celtic Frost styles while giving the songs some diversity with newer elements. In the end, what could anyone expect from this chameleon like band after a hiatus of thirteen years? This release had the opportunity to become something really big but falls a bit short of the mark. I believe the Frosties are still testing the waters so to speak. Sure, we could have hoped for another "Morbid Tales" or "To Mega Therion". One thing we don't get is anything close to "Cold Lake" or even "Vanity Nemesis". I'd say it's more of a twisted hybrid between the avant gard influences of "Into The Pandemonium" with the slow heaviness of "To Mega Therion" while being more simplistic in the amount of riffs, time changes and the complexity of guitar solos. I still feel the album could have used less or no avant garde influences and more up tempo songs like those found on "Morbid Tales". Also, it could have used more incoherent, off the wall Tom G. Warrior guitar solos. As with any Celtic Frost album, you are either going to really like this or hate it. The album will be released simultaneously in all territories in three different configurations, including a limited-edition digipak containing the bonus track, "Temple Of Depression" and a vinyl LP with another bonus title, "Incantation Against You". It will be available through the band's new label, Century Media Records.